Our customers in Starkville, MS have never felt better in their clothes! We are D’Lux Alterations, and we’re here to give you the perfect fit! Many of our customers complain that nothing they find in the store fits the way it should. They want more than anything to feel completely confident in their clothes. You may be surprised to discover that most people require alterations to their clothing before it fits perfectly. Clothes are produced in enormous quantities, and factories follow a standard pattern. They replicate this pattern over and over again to complete the order. Clothes are then shipped to the retailer, and their job is done. Everyone is unique – so, it’s no surprise that many of us don’t find the perfect-fitting outfit on the racks. We perform any type of alteration you need to get the fit you desire. Professional wear is altered to make you feel a little bit lighter on your feet in the office. Got a suit you’ve been dying to wear? Let us handle your alterations. Perhaps you need some slacks hemmed for a big meeting. Bring them to us and we’ll make sure you enter the room with complete confidence. If you’re lucky enough to not have problems finding clothes that fit, you might soon discover another problem. Your favorite jacket or another article of clothing has a hole. Before you give up and get rid of it, we can fix your favorite outfit to make it appear brand new. You won’t even remember where the hole was. We fix pants, shirts, dresses, and formal wear. We’re even equipped and experienced to handle your wedding gown and the attire for your entire wedding party. 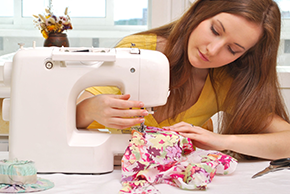 Our seamstresses are experienced, friendly, and customer focused. We’ll make sure everyone is fitted and looking great for your wedding. We’re waiting to make your wardrobe spectacular! Get in touch with us today!